This morning, Motorola officially unveiled their new smartphone dubbed the Moto G. It’s every bit as mid-range as we expected it to be because that’s exactly the point. Motorola doesn’t think that off-contract buyers of smartphones should have to pay $600 to enjoy a premium experience that’s capable of running the latest apps and versions of Android. With Moto G, you are looking at a phone with the latest Qualcomm Snapdragon processor, HD display, and a price starting at $179 full retail. Yes, we’re now talking sub-$200 for a smartphone. In terms of features, the phone runs a Qualcomm Snapdragon 400 (quad-core) processor and shows off Android through a 4.5-inch HD display (edge-to-edge). You are looking at an un-skinned Android 4.3 out of the box, with an upgrade to Android 4.4 Kit Kat coming in early 2014. Should you be looking at a downside, there is one major feature missing: LTE. The phone will work great on HSPA+ and even CDMA, but unfortunately, an LTE chip was not included. If you were hoping for some of the customizable options that are included in Motorola’s flagship Moto X, you get some of that as well. There are 19 customization items in total, thanks to interchangeable backs called Grip Shells, Flip Shells, and Motorola Shells. It sort of is like a mini-Moto X in a way. 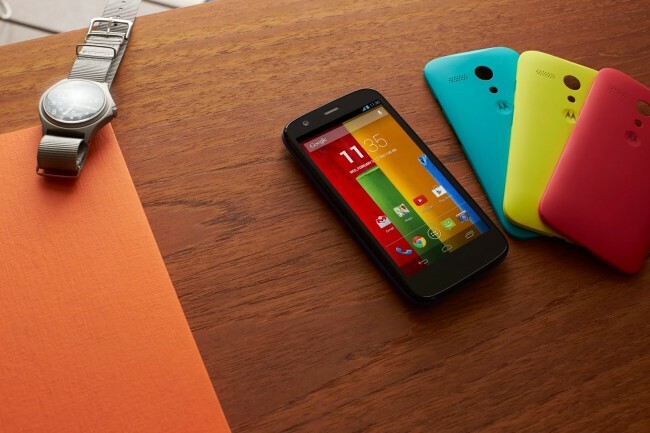 The Moto G goes on sale this week in Brazil and parts of Europe. In the following weeks it will land in Latin America, Europe, Canada and parts of Asia. A U.S. launch is expected to happen in January 2014. The U.S. variant will cost $179 for an 8GB model and $199 for a 16GB model.